at the weekend. Many thanks to Mike Carew for bringing one back from the US for me via Dale. When I got to the point where I had to configure which WiFi network the chromecast should connect to there was a problem as my router’s SSID was not showing in the list. It took a couple of minutes for me to remember that I had set my router to use channel 13 as it’s normally lightly used. The reason it is lightly used is because in the US you can only use channels up to 11. A quick change of channel later and the network showed up in the list. The next part is the only bit that is not as slick as it should be. The Chromecast was fully configured but when I tried to use one of the apps (I’ll talk about those in a moment) it would not show a Chromecast available to send data to. The problem was that my router had done it’s usual trick of walling each of the separate WiFi device from each other, this feature can be called a few things but the most common seams to be apisolation. In a place with shared WiFi like a coffee shop or hotel this is good as it stops people snooping on or attacking your machine, in the home environment this may not be suitable and in this case very much unwanted. I had run into this problem before as one of my MythTV frontends is on WiFi and I had changed the settings to allow WiFi cross talking but the router seams to forget the setting pretty quickly, my usual trick was to reboot my router if I needed to log into it from my laptop to fix things. This was going to become a real issue with the Chromecast. After bit of digging I found a forum post about how to tweak the settings via the telnet interface so quickly ran up an expect script to do it when needed. send "wireless mssid ifconfig ssid_id=0 apisolation=disabledr"
This gets called by the script I’ve got bound to a button on my remote driving LIRC that changes the input on my TV from RGB used for MythTV to the HDMI socket used by the Chromecast which ensures my network is always setup properly. I really shouldn’t have to do this but O2 Wifibox III I have is not the best. Once I’d got all that out of the way time to start actually using this thing for what’s made for. Out of the box there is support for the Chromecast baked into the latest version of the Android YouTube app, Google Play Music, Google Play Movies and Netflix app. I don’t have a Netflix account at the moment so I tried out the other 3. When the YouTube app finds a Chromecast on the local network it adds the little cast icon to the Action bar. When you tap on this it displays a pop-up to all you to select the Chromecast (if you have more than one on the network) and then rather than play the video on the devices screen they are played on the TV. Play/Pause and volume control are available on the device. One other really nice feature is that the Chromecast maintains a queue of videos to play so you can add to the queue from your phone while it’s playing the current video, in fact if you can do this from multiple devices at the same time. This means you can take it in turns with your mates to see who can find best cat video. 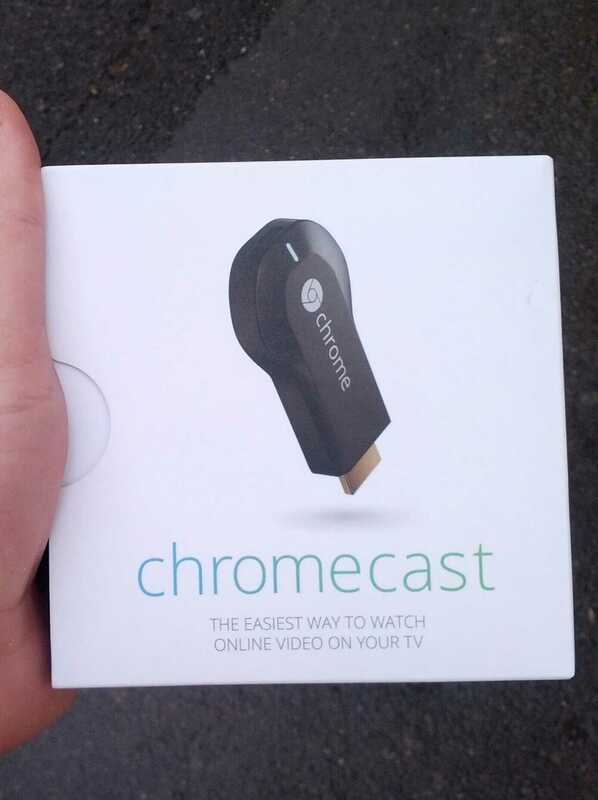 Much like YouTube Google Play movies lets you play content on the Chromecast. I had rented a copy of Mud the week before getting hold of my Chromecast so I watched this on the TV rather than on my Nexus 7. The only odd part was that I had downloaded a copy to the device and it would not let me watch it via the Chromecast without deleting the local copy. The music app works as expected, showing the cover art on the screen while it plays the tracks. Because it streams tracks directly from the cloud if you are working through a playlist and hit a track that you have added directly to the storage on the phone then it will refuse to play even if you have pushed a copy of the file to Google Music’s cloud storage. Away from applications on your Android device there is a plugin for the Chrome browser which allows you to share the content of any tab on the large screen. I need to have a look at using this for giving HTML5 based presentations. There is a API for interacting with the Chromecast and and I’m going to have a look at writing an app to push MythTV recordings so I can replace one of my MythTV frontends. First impressions of the API make me think this shouldn’t be too hard if I can set up the right transcoding. Over all I’m pretty impressed with the Chromecast and I’m still debating if I should ask my folks to bring me another one back as they are out in the US at the moment. So there has been a bit of buzz recently (mainly about how to get a invite) about a new game from the Google NianticLabs called Ingress. It is a AR game where users do battle for one of two factions in a virtual world overlaid on top of the real world. The game is still in closed beta at the moment and only open to people with invites, you can apply for an invite here. You can also submit Ingress inspired art work to Google Plus and tagging Brandon Badger, Brian Rose, Anne Beuttenmüller and +Joe Philley and hope they are impressed enough to let you in. The premiss is that the work at CERN hunting for the Higgs boson has caused the release/discovery of something called Exotic Matter (XM). This XM seams to be capable of influencing human behaviour, especially in the creative and scientific direction. Following this discovery those that know of it’s existence fall in to two factions, the Enlightened who believe that XM is sent to help humanity and the Resistance who believe that XM is part of a slow insidious invasion. As well as XM there are portals which seam to be related. Portals can be captured and things called Resonators added, with these three or more portals can be linked together to create fields in the enclosed space. These field allow the Enlightened or the Resistance to try and influence the public to their way of thinking. The battle is to create the largest fields and influence the most people. If you happen to live in an area with no portals you can add new ones to the game by sending geo-tagged photos of “interesting” locations to Google via the app, but they take between 2-3 weeks to be added. That seams a long time for somebody to maintain an interest if they are in a area with little or no existing portal, I’m still waiting for any of mine to appear, but I’ve managed to stay engaged by playing around the 4 portals up in Winchester. There is the start of a strong social aspect to the game as well, you need to arrange for other members of your faction to coordinate attacks on portals (especially the higher level version)in order to capture them back from the opposition and you also need their help to upgrade portals to higher levels to enable longer range links. There are plenty more detailed discussions about the game online so I won’t go on any more about that here. What is more interesting is the potential this sort of platform has. The combination of crowd sourcing and gamification may well lead to something like the game Spooks, from Charles Stross‘ Halting State. I’m not suggesting any thing as sinister as Spooks, where the EULA turned out to be a click through copy of the Official Secrets Act, and the whole thing was being run by MI5, but it’s important to remember that Google are not running this game for fun, to start with it’s a way to get more people to volunteer more location data and also a nice way to collect a bunch of geo-tagged photos from the portal submission process. I’m already signed up to Latitude so it’s not a problem for me to send my location to google again as part of the game but I do wonder how many other players are aware of the trade they are making to play the game and what else they may need to trade as the game continues. Set tasks to submit photos of new buildings/locations to keep things like Streetview up to date. Taking it a step further, with the right mechanisms built in to evaluate trust could you build a cheap/free delivery service having players deliver packages across a city? These are just a few that came to mind as I was putting this post together, I’m sure there are many more. I’ll be keeping an eye on how it develops and of course capturing portals for the Resistance.